Part of a series on corporate boards and directors. Members of compensation committees must be independent directors with no financial ties to the company or its executives, say rules adopted after the financial crisis. At LHC, however, two of the committee’s three members are lobbyists for LHC, which foots the bill for their work. The two are former Sen. John Breaux and former Rep. Billy Tauzin, both of Louisiana. The 2010 requirement that only independent directors can set executive pay at most public companies was the latest in a string of efforts by Congress, regulators and stock exchanges to make sure people who hold important roles on corporate boards are free of potential conflicts of interest that could sway their judgment. A Wall Street Journal review of lobbying data and securities filings found that despite such efforts, financial ties persist between some corporate directors and CEOs—ties running through Washington’s lobbying corps. They involve directors whose lobbying fees are paid either by the company where they are a board member or by an industry association where the company’s CEO has influence. In the case of Messrs. Breaux and Tauzin, it is both. They are paid lobbyists for LHC as well as for an industry group co-founded and chaired by LHC’s chief executive, Keith Myers. An LHC executive said its board conducts a yearly review of the independence of each director and has determined that Messrs. Breaux and Tauzin qualify. Mr. Tauzin’s office referred questions to LHC, as did Mr. Breaux’s. The Journal found nearly a dozen large companies where directors on important board committees were also lobbyists paid either by the company or by a group at which the company’s CEO had influence. At Boeing Co., the lead director, deemed independent, has for years been a lobbyist for a business group that Boeing CEOs helped oversee in many of those years. At railroad Kansas City Southern, a director helps determine the CEO’s pay and also works at a lobbying firm retained by a trade group on whose board the CEO recently served. There is no evidence these ties influenced decisions by either the CEOs or the board members. They raise questions, however, about whether such board members are independent to a degree that allows them to serve the best interests of shareholders while serving on sensitive committees. Ties between directors and trade groups overseen even partly by a company executive deserve serious attention from boards, said Douglas Chia, executive director of the Governance Center at the Conference Board and a former corporate secretary for Johnson & Johnson. Many such directors are former government officials. Companies have good reason to court such officials, who can provide access to lawmakers or regulators and help navigate the bureaucracy. About half of the 500 largest U.S. companies have one or more former government officials on their boards—more than 300 directors in all—according to data from ISS Corporate Solutions, a unit of proxy adviser Institutional Shareholder Services. Whether some are also paid lobbyists isn’t easy to know because the federal rules on who must register as a lobbyist are relatively relaxed. People who lobby but spend less than 20% of their time on the task don’t have to register, nor do those who work behind the scenes to influence legislation. Lobbying ties among companies and directors could be more common than the Journal review suggests. Public criticism of CEO pay helped lead to the rules to avoid board conflicts of interest. The critique of CEOs’ pay, which in the U.S. often runs 200 to 300 times the pay of ordinary employees, by various estimates, grew louder after the financial crisis. It was the postcrisis Dodd-Frank legislation that said directors serving on compensation committees must be independent. The idea is there must be no ties that could tempt a director to treat a CEO especially generously—or that, in turn, could tempt a CEO to keep a director happy through a paying role such as lobbying. The provision joined existing laws, regulations and stock-exchange rules that said board members on audit and nominating committees also must be independent. The rules on who is independent draw some bright lines, excluding any director who is related to the CEO or recently worked for the company. Companies must disclose “related-party transactions,” where a director has dealings with the company or its executives, and “interlocks,” where executives of two companies sit on one another’s compensation committee. Beyond this, boards are free to decide whether a director is independent. Their decisions usually stand unless challenged by stock-exchange officials, regulators or investor in a lawsuit. Shareholder suits raising the issue are rare. Regulatory challenges usually go no further than urging boards to fix any problems, without bringing the matter the public, regulators say. In some cases, director-CEO ties the Journal identified date from well before the Dodd-Frank law. At Boeing, Kenneth Duberstein, a former Ford administration official and White House chief of staff under President Reagan, joined the board in 1997. He has a lobbying firm, Duberstein Group Inc. One of its clients since 1998 has been the Business Roundtable, an association of big-company CEOs. Federal records show the Roundtable pays Duberstein Group nearly $400,000 a year and has paid it $5.6 million in all. Boeing executives weren’t among the Roundtable’s top officials when the group first hired Mr. Duberstein’s firm. Boeing’s chairman or CEO served on the Roundtable’s executive committee in 12 of the following 18 years, however, and as the Roundtable’s chairman in four of those years. Jim McNerney, who retired as Boeing CEO last year, was on the Roundtable executive committee from 2009 through mid-2015; Boeing’s current CEO, Dennis Muilenburg, joined it this year. Mr. Duberstein now is Boeing’s lead director, chairman of its governance committee and a longtime member of the compensation committee. He approves meeting agendas and leads executive sessions and talks with shareholders, securities filings indicate. A Boeing proxy statement said Mr. Duberstein led the process that promoted Mr. Muilenburg to CEO in June 2015 and that invited Mr. McNerney to remain chairman for eight more months. In 2015, Boeing paid Mr. McNerney about $20 million for his last six months as CEO and final year as chairman. Mr. Muilenburg received a 12% raise to about $13 million. Boeing said its board follows a code of conduct that addresses potential conflicts as well as requirements for director independence, considering all the circumstances. A company spokesman, Charles Bickers, notedthat Mr. Duberstein served on the boards of Boeing plus a predecessor company, McDonnell Douglas, for about a decade before he began lobbying for the Business Roundtable. Messrs. McNerney and Muilenburg had no additional comment, another Boeing spokesman said. Roundtable President John Engler said the group’s staff decides which lobbyists to hire. The executive committee on which Boeing CEOs have served approves broad spending plans, not specific contracts, and hasn’t recommended specific lobbyists during his tenure, said Mr. Engler, a former Republican governor of Michigan. Mr. Duberstein said he has never talked with Boeing CEOs about his firm’s lobbying for the Roundtable, and there hasn’t been a need for the Boeing board or its governance committee to discuss the relationship. He said his decisions as a Boeing director aren’t influenced by his role as the Roundtable’s lobbyist. “I don’t even get close to the line, let alone step over it,” Mr. Duberstein said. One member of the compensation committee on Kansas City Southern’s board is former Transportation Secretary Rodney Slater.He also works for a law and lobbying firm, Squire Patton Boggs. An industry group called the Association of American Railroads has paid Squire Patton Boggs $2.4 million for lobbying over eight years. In 2013 and 2014, Kansas City Southern’s then-CEO, David Starling, was on the railroad association’s board. Mr. Starling’s pay more than doubled from his first full year as CEO in 2011 to $7.9 million last year. A spokesman for the railroad association said its board members aren’t involved in deciding which lobbying firms to hire. A Kansas City Southern spokeswoman, C. Doniele Carlson, said Mr. Slater doesn’t personally lobby on the railroad association’s behalf. Kansas City Southern’s latest proxy filing said transactions or relationships between the company and its directors, executives or major shareholders are reviewed by the Nominating and Corporate Governance Committee of its board, which makes sure any out-of-the-ordinary transactions are disclosed properly. “There were no related party transactions in 2015,” it said. Mr. Slater heads the nominating and governance committee. Messrs. Breaux and Tauzin at LHC Group, a Lafayette, La., company that provides in-home nursing, left Congress in 2005 after long careers. Both became lobbyists. Mr. Tauzin, a Republican, joined LHC’s board as its lead director in 2005, and Mr. Breaux, who is a Democrat, joined two years later. In 2013, both joined the compensation committee. Its third member is a former Tauzin aide in Congress. LHC pays $20,000 a month to the lobbying firm that employs Mr. Breaux, Squire Patton Boggs, federal lobbying records show. At the firm, Mr. Breaux is listed as among those handling duties on behalf of LHC. The records show that since 2008 LHC has paid $1.25 million to Squire Patton Boggs and a firm it acquired, the Breaux-Lott Leadership Group, which Mr. Breaux co-founded. LHC’s Mr. Proffitt said his company also paid $200,000 last year and through this August to Tauzin Consultants, a lobbying firm Mr. Tauzin formed with his son Thomas. The son owns the firm and his father is a consultant there, said LHC. Tauzin Consultants, in turn, paid Tauzin Strategic Networks—a firm owned by Billy Tauzin—$100,000 during the same period, Mr. Proffitt added, for what federal lobbying records describe as work “on behalf of LHC Group, Inc.” Federal records show higher figures because of rounding, Mr. Proffitt said. 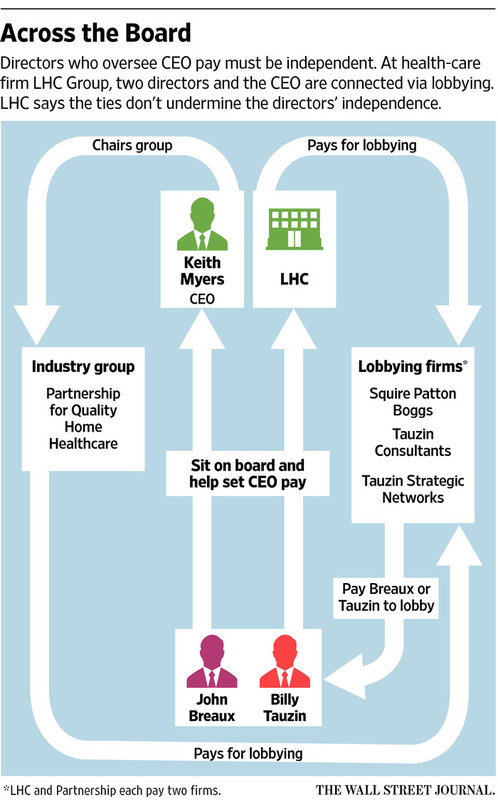 An industry group called the Partnership for Quality Home Healthcare also has employed Messrs. Breaux and Tauzin’s lobbying firms for several years. LHC’s chief executive, Mr. Myers, co-founded the Partnership and is its chairman. Federal records show the Partnership paid $1 million from 2010 through 2013 to Mr. Breaux’s employer Squire Patton Boggs and the Breaux-Lott firm it acquired. The records also show the Partnership has paid Tauzin Strategic Networks $1.8 million since 2011. In yet another lobbying connection, LHC’s Mr. Myers has in recent years served on the board of a second industry group, the National Association for Home Care and Hospice, which paid about $1.2 million to Squire Patton Boggs and the Breaux-Lott firm from 2008 through 2014. The association didn’t respond to requests for comment. Part of a series on how business is done on corporate boards. LHC proxy statements disclose unspecified consulting relationships with Squire Patton Boggs and Tauzin Consultants without giving dollar amounts. Thomas Tauzin’s office referred questions to LHC. Mr. Proffitt, the CFO at LHC, said its agreements are with the lobbying firms that employ the board members, not with them personally. Messrs. Tauzin and Breaux are both registered as lobbying for LHC. Mr. Myers, LHC’s chairman as well as its CEO, earned $1.76 million in 2013, which jumped nearly 50% in 2014 to $2.6 million, and then rose in 2015 to $3.38 million. LHC’s net income fell 2.2% to $21.8 million in 2014 before rising to $32.3 million in 2015. In investment terms, its total return—stock gains plus dividends—trailed the medical-care industry in 2014 but exceeded it significantly in 2015, according to Morningstar Inc. data. The LHC compensation committee in 2014 also restored a CEO perk that had lapsed, the right to use the company plane for personal travel. Through 2015, latest proxy statements say, Mr. Myers has taken about $160,000 worth of personal trips on it.